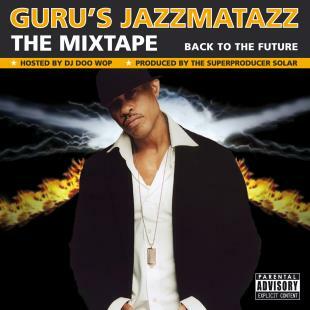 Guru’s Jazzmatazz Back To The Future Mix CD is the “raw” companion to the Jazzmatazz Vol. 4 album. The Mix CD carefully and superbly crafted by Superproducer Solar to exhibit that “Golden Era” New York essence along with a cutting edge futuristic twist! Hence the title, “Back To The Future”. The tracks are pure “bangers” and the guest appearances are classic as they compliment Guru’s iconic yet streetwise vocals. These MC’s represent the best of Americas true Hip Hop artists that hail from the “Underground” scene that Guru has remained so true to. There are features from artists such as Common, Damian Marley, Aceyalone and Zion I from the West Coast, Blue Scholars from Seattle, Mr. Lif from Boston, Yungun from London, as well as legends Lord Tariq from the Bronx, Nature from Queensbridge, C. Knowledge from Digable Planets and Tony Touch to name a few. The album also features up-and-coming 7 Grand Records artists K. Born and Highpower from Philadelphia and Young Pablo from Paterson, New Jersey. This is no ordinary Mix CD as it is hosted by the Mix Tape King himself DJ DooWop who also “spits fire” on a couple of “joints”! This is indeed another Jazzmatazz classic that’s sure to make the REAL heads nod!